Really. That’s all you need…well, plus your flowers, of course. I wish I had a picture to show you what the vase looked like before, but I was so anxious to transform it that I totally forgot to take one! Just imagine this same vase, totally clear and normal and boring. 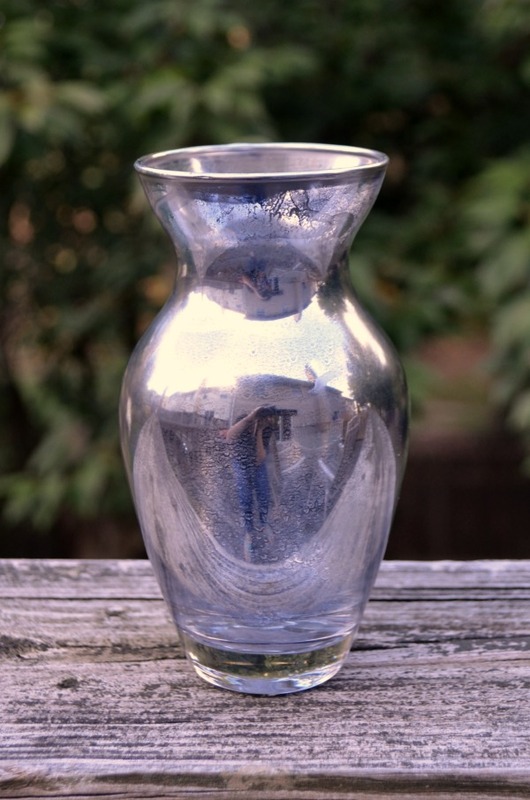 All you have to do to create this mirror effect is clean the vase, shake your spray can for two minutes, then spray a light coat on the inside of the vase. Let it dry completely and repeat until you have the level of coverage you want. The more coats you do, the more opaque and shiny your finished product will be. I used four coats on my vase. After the paint is dry, it’s time to add flowers! I found these pretty yellow silk ones on sale at Michaels, which was perfect since I’m going with a gray, yellow, and teal theme in my living room. Plus, they’re a great color for fall. I’m really enjoying the way they brighten up the room and add a touch of cheerful color. What do you think? What would you put in your vase? Love your vase! I wonder if the hardware here keeps that kind of paint? will have to look into this…. They may…if they don’t, I know Michaels carries it! What a beautiful vase, Amy! It’s amazing how spray paint can turn something blah into something AMAZING! Amazing Job. They look super amazing! Neat paint! There are so many paint varieties these days!